WEST POINT—West Point cadets competed with the U.S. Naval Academy and the Royal Military Academy of Canada in the 16th annual Cyber Defense Exercise (CDX) on April 11-15 against the National Security Agency. Cadets successfully defended their networks against the NSA to keep systems online and achieved the highest score when the competition ended. Each military academy in the exercise was scored on their ability to maintain services, prevent and recover from security breaches, and provide forensic analysis of compromised systems. The NSA launched attacks on the network of each military academy over a three-day period. The NSA gave each academy points on how they solved hacking attacks which was on a screen in real time. “At any point in time, we can figure out what the score is,” Gardner said. He pointed to the screen that showed the West Point team in the lead. The team of 26 cadets provided a web server, email, and a file transfer protocol (ftp) for the users, who could be anyone from a general to a soldier using the system. Most of the team are computer science majors. Others major in information technology, electrical engineering, mechanical engineering, math, and a foreign language. The exercise teaches students how to protect and defend the nation’s information systems. Like a scrimmage in a football game, players get experience working as a team against an opponent. A referee keeps players within the rules of the game and each team wants to win with the most points. Several boards provided real-time information to the team. When the team found bad traffic, it was listed on the whiteboard column called Bad Actors. Cadets formed five teams—monitoring, networking, systems, services, and forensics. Gardner said each team has their own tasks over the three days. Monitoring logs in all traffic and identify the biggest cyber threats. The Networking team designed the entire system for the exercise and figured out anything new the NSA might add to their system. The NSA team added a general’s laptop to the cadet’s network. The team had to see if it was infected with any computer virus. The systems team kept all the network’s services—email, ftp, and web server—working and secure. Gardner called Forensics the “quick reaction force” that had to solve immediate hacking attacks. Sophomore cadet Adam Van Prooyan worked on the forensics team. He analyzed malware brought by the NSA. He said his team worked on a web app, a kind of internet chatroom, called an ARCbot (Advanced Really Cool bot) the NSA gave them, to see if it was infected. It was a lot of fun to dig in there and see what may be an attacker would find there and how to fix that. This is what he likes to do. “It was a lot of fun to dig in there and see what may be an attacker would find there and how to fix that.” Van Prooyan’s father and grandfather both graduated from West Point. He wants to join the Army’s Cyber Branch as a developer when he graduates. Maj. W. Michael Petullo and three officers circulated among the students. The officers were on hand to guide the West Point team but were not allowed to directly take part. You’ll see a lot of mentorship going on. I’m helping to guide the students towards a different way to approach or view the problem. Orsene said all officers must go through the training center, called the Cyber Common Technical Corps. She will give a report on the exercise to the cyber school about the exercise. Orsene is a senior instructor there and teaches networking and security. 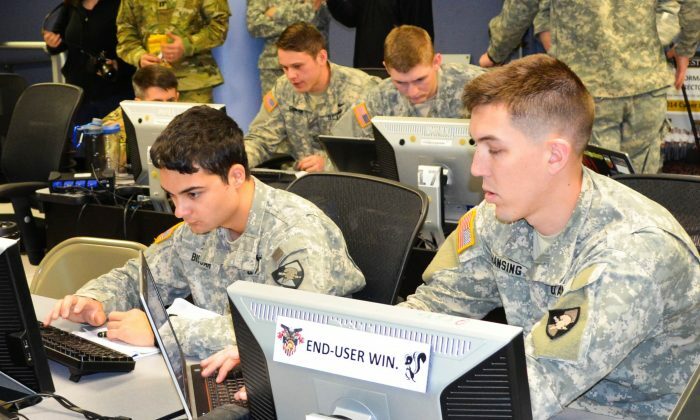 The exercises are designed to prepare future military leaders to defend the nation’s computer systems. In 2001 the NSA established the competition, which challenges each team to design, build, and configure a real-world computer network similar to what you would find in today’s military. Gardner said that cadets with computer expertise can join SIGSAC, a cadet computer club. “After about a year or two they have the opportunity to try out for the C3, the Cadet Cyber Competitive team. They compete all around the country in different types of school-sponsored hacking or defending exercises every month,” he said.